Be the first to share your favorite memory, photo or story of Jonathan . This memorial page is dedicated for family, friends and future generations to celebrate the life of their loved one. 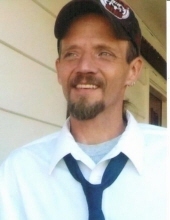 Jonathan Harry Stiltner 39 years of age of Vansant, VA passed away at his residence December 25, 2018 from an apparent accident. Born in Grundy, VA January 31, 1979 he was the son of the late John Hartford Stiltner and Shelia Kay Owens Stiltner. He was a disabled mechanic and was of the Christian faith; he liked to work on motorcycles and four wheelers. He was an avid outdoorman, enjoyed riding four wheelers and motorcycles with his son’s and horses with his daughter. Jonathan was a very outgoing person, he never met a stranger and would go out of his way to help anybody he could. Loving husband, father, brother and friend to many. He is survived by his wife of seven years Jessica Dawn Adkins of Vansant, VA; sons Johnathan Stiltner, Jr. of Mouth Card, KY, Jonathan Michael Owens of Vansant, VA; daughters Melissa Jayde Adkins of Vansant, VA and Hannah Cantrell of Mouth Card, KY; Brother Thomas Hartford Stiltner of Abingdon, VA; sister Katlin Boyd of Vansant, VA; father and mother-in-law, Jeffery Charles and Melissa Charles of Rowe, VA. He was also survived by one grandchild on the way; several nieces and nephews including special nieces, Arianna Adkins, Brianna Stiltner and nephew Justin Isaiah Adkins. Funeral services for Jonathan Harry Stiltner will be conducted Saturday, December 29, 2018 at 1:00 p.m. at the Shortridge-Ramey Funeral Home Chapel, Keen Mountain, VA with Ministers Shawn Dotson and Brian Moore officiating. Burial will follow in the Stiltner Family Cemetery on Webbs Branch, Oakwood, VA. Active pallbearers will be: Danny Boyd, Carl “Turtle” Adkins, Justin Adkins, Johnny Job Stiltner, Josh Stiltner, William Stiltner, James Day and Ty Emerson. Honorary pallbearers will be: Jeffery Charles, Kelver Viers, Johnathan Stiltner, Jr., Jonathan Michael Owens and Buckey Stiltner. The family will receive friends at the funeral home after 6:00 p.m. Friday where a evening service will be held at 7:00 p.m.
Memorial condolences may be viewed at shortridgeramey.com. The family of Jonathan Harry Stiltner have entrusted the care of their loved one to Shortridge-Ramey Funeral Home of Keen Mountain, VA.
"Email Address" would like to share the life celebration of Jonathan Harry Stiltner. Click on the "link" to go to share a favorite memory or leave a condolence message for the family.